Review – Heart in a Box explores a lot of different issues in sometimes poignant, very often painful ways. Family, loss, betrayal, friendship, love, companionship – but none of that is what caught me and kept me reading. What kept me reading was the honest sincerity of it all. I’ve never been in Emma place, but I’ve been hurt and I can relate to those feelings if not that experience. The aching gulf of betrayal when you realize you gave your heart to someone who didn’t care, that feeling of detachment from it all because why bother? The knowledge, whether true or not, that you just weren’t enough. That rage because how could they do this to you. Its a feeling anyone who has ever cared about another person understands. And for Emma, The Man With No Name was just the latest in a series of heart breaks where she lacked any ability to take control of the situation. Look its not easy caring, especially if you care with all your heart like Emma does. When you go all in on someone, when you think your future and theirs are so intertwined there is no future without them…its so much easier to just NOT. Not care. Not try. Give up. Not die, but just not…live really. 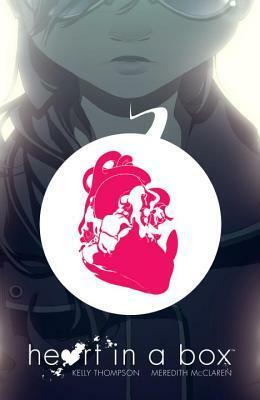 And Emma experiences that firsthand when she’s offered a chance to give up her heart by Bob. Its a little unclear whether its her literal heart or not (there’s a physicality to it that I’ll explain a bit more later), but the effect is immediate. Emma goes from bright colors to drab dreary grays and brown as she “lives” her life without a heart. She no longer has the pain of the betrayal from the Man With No Name, but she also can’t find any sort of interest in the rest of life either. Thus does she try to re-negotiate with Bob (who’s just a middleman really) to gain her heart back. But as with anything in life, something worth having is immensely harder to retake then give up sending Emma on a cross-country trip to find the pieces of her heart that have been spread across several sources. I mentioned earlier some confusion over whether Emma physically lost her heart, or if it was metaphorical sort of thing. Bob tells her she needs to collect the pieces of her heart that she needs to recover and put them inside a box. One of the first people she comes across, someone who also deals in the heart (so to speak), she needs to PHYSICALLY get the piece from him. Later its a matter of having it, more or less, willed back to her. Looking back at her journey it follows a pattern that not only let’s her get her heart back, but also able to deal with the ramifications (all the painful painful ramifications) of getting it back. She’s a much stronger person by the end for having gone on the journey and met the people she did. As an allegory to how we deal with pain and learn from it, Thompson (who I already know can do a superb job at handling these issues–see THE GIRL WHO WOULD BE KING or her current run on the JEM AND THE HOLOGRAMS comic–is thoughtful and doesn’t exclude that sometimes the answer isn’t to forget, but to remember. McClaren, whose artwork I’m less familiar with, is a very good foil to the story. The sometimes minimalist scenes or exaggerated moments blend perfectly with Thompson’s story telling.